Is This the Biggest Threat to Amazon's Business Model? The company has been investing heavily in delivery, which gives it an edge over other retailers. Amazon (NASDAQ:AMZN) has foregone short-term profits in favor of building its business for the future. This has involved tremendous investments in infrastructure. Specifically, the company has made an unprecedented commitment to shipping. In the United States alone, Amazon has not only built out a network of warehouse facilities across the country, it has also pioneered the use of predictive algorithms to predict what customers will order before they actually buy anything. The online retail giant has also worked to ship as fast as possible, offering same-day delivery in parts of the country and Sunday delivery as part of a unique deal with the U.S. Postal Service. Speed has not been the only area Amazon has pushed on. The company also recently announced free shipping for anyone on products that weigh less than eight ounces and cost less than $10. Money has been no object in the retailer's quest to improve its shipping process. It even spent $775 million to buy robot-maker Kiva Systems in 2012 in order to better dispatch the company's robots into its warehouses. The machines, however, have not replaced the company's human investment, as Amazon has steadily added to its fulfillment workforce. We're proud to be creating more than 6,000 full-time positions where employees will interact with state-of-the-art technology as part of their day-to-day roles. 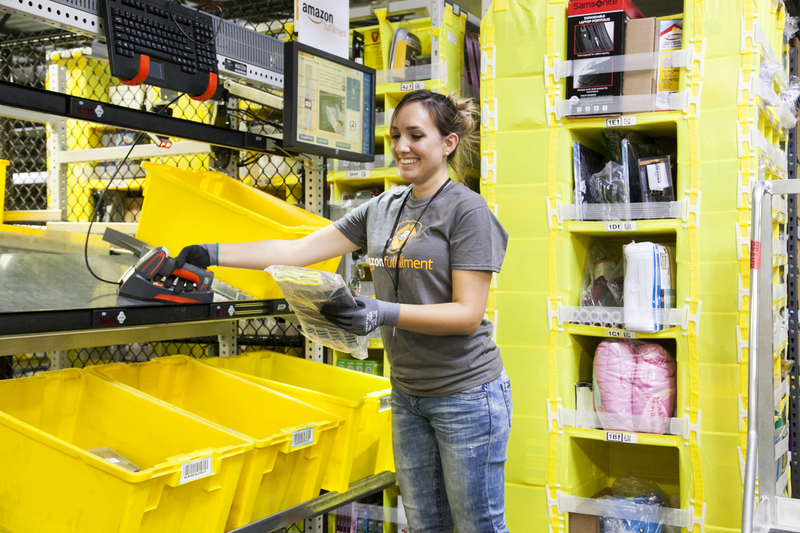 Amazon not only offers great pay and benefits, we also encourage our employees to continue to grow in their careers. The company is betting that by investing in shipping and perfecting the fulfillment process, it will create a huge barrier to competition. That has worked so far, but is it possible that Amazon could have bet wrong? Is it possible the company's greatest strength could also be the biggest threat to its business? Human workers work alongside their robot counterparts in Amazon warehouses. Source: Amazon. Jerry Jao, CEO and co-founder of Retention Science, a venture-backed company that works with Target (NYSE:TGT), The Honest Company, and Dollar Shave Club among others. He told the Fool in an email interview that Amazon has done a good job differentiating itself to consumers based on shipping. Jerry Jao. Source: Retention Science. Amazon is more than an e-commerce platform, it's really a logistic company. All the different features and benefits are good for branding as they own the "mind share" in the minds of the consumers, i.e., whenever I think of buying something, I look on Amazon first. This action itself is powerful. It's almost like a shopping comparison engine (like what Google (NASDAQ:GOOG) (NASDAQ:GOOGL) is for everything else). But, while he likes what Amazon has done, Jao calls its advantage "sizable, but not completely disrupt-able." He think the company needs to be prepared for competitors citing the rumored launch later this year of Jet.com, which brings the Costco (NASDAQ:COST) subscription model online. He also believes some of its larger bricks and mortar competitors could challenge the Amazon shipping advantage. "For example, large retailers like Walmart (NYSE:WMT) and Target can match Amazon's offerings," he added. To ultimately prove out its business model, Amazon, he explained, will not only need to continue to build its shipping advantage, it will also need to serve customers in the best way possible. "The rest of the shopping experience depends on the customer experience, product selections, etc.," he wrote. "It all comes down to who can provide the best economics for the customers in a price war." While Jet offers theoretical competition, and the major retailers could challenge Amazon for online sales, it's worth noting that Amazon remains the innovation leader in shipping. Walmart and Target have the scale to match the online leader, but they have not invested as heavily in improving the process. Both of those companies could change that, but it's hard to see how they will not alway be a step behind. If Target adds robot efficiency, for example, it still would be behind in new areas Amazon is exploring, like drone delivery. The only scary part for Amazon investors is that should other retailers seek to level the shipping playing field, the company could be forced into a prolonged arms race to maintain its advantage. That could mean more years of heavy investment and a delay to the payoff. That's a risk, but right now, it's a war Amazon is winning.